An interesting article was printed in todays Herald, not that we deerhounds need research to understand the subject . . . we just do! Read below, and if this line of research interests you - follow through on the links to further expand your interest. Dogs seem to read emotion in human faces in the same way people do, scientists say. It may be evidence that they can see at a glance whether we are happy, sad, pleased or - particularly - angry. When humans look at a face their eyes tend to look left and fall on the right-hand side first. This "left gaze bias" only occurs with human faces not with animals or inanimate objects. Researchers at the University of Lincoln have shown that pet dogs also exhibit left gaze bias, but only when looking at human faces. No other animal has been known to display this behaviour. A team led by Dr Kun Guo showed 17 dogs images of human, dog and monkey faces, and of inanimate objects, and found strong left gaze bias with human faces but not with other images, including those of dogs. New Scientist magazine reported yesterday: "Guo suggests that over thousands of generations of association with humans, dogs may have evolved the left gaze bias as a way to gauge our emotions. "Recent studies show that the right side of our faces can express emotions more accurately and more intensely than the left, including anger. If true, then it makes sense for dogs - and humans - to inspect the right hand side of a face first." Whether left gaze bias means that dogs read human emotions is still uncertain. Dr Guo believes he has some evidence that they can distinguish between emotional states. A follow-up study showed that angry human faces induce a much stronger left gaze bias in dogs than neutral or happy faces. Having just returned from a nocturnal jaunt, confused by the daft human ‘un-natural’ need for something called time - where their measuring devices were changed this weekend and now my natural routine is upset. Still, I have just pursued Mr Badger into the bracken, he happily disapeared into the dark and this reminded me that coursing takes place one week from today at Rumbling Bridge. If you are interested in attending this with your deerhound on Sunday the 2nd of November from 11am - email: (as before) sue@thehoundpad.co.uk and tell them Rogue sent you. Watch the video footage above to see me in action at the last Rumbling Bridge Run Off event along with some of my friends. Enjoy! From a Big Country where dreams stay with you! Yes . 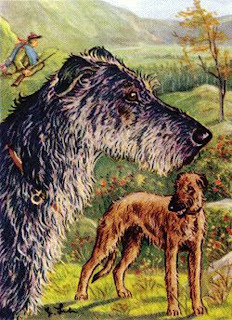 . . them Hollywood types are at it again - using us highland hounds to represent the more likely ‘lymers’ or ‘greyhounds’ of the period, used in pursuit of the game of ‘auld’. This time Deerhounds appear in The Other Boleyn Girl. A Production lavish in costume and with ‘braw’ hounds. You can find out more about the movie or purchase it by following the link above. With the approach of that ancient Celtic time of the season Hallowe’en - where the nights fill with all sorts of strange goings on . . . 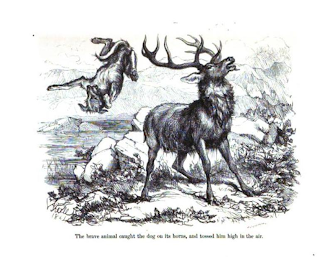 Rogue, thought he’d bring you this little tale from the book Scottish Fairy and Folk Tales by Sir George Douglas 1901. 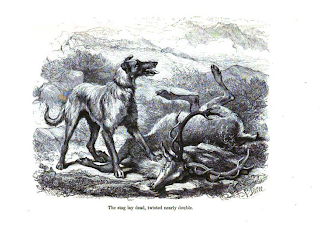 It’s relevant to deerhounds through the included characters that populate the tale. And if you are of nervous disposition, approach the following tale with caution. Enjoy the embedded links to find out more about the area in which the tale takes place. A hero, celebrated for his hatred of witchcraft, was warming himself in his hunting hut, in the forest of Gaick, in Badenoch. His faithful hounds, fatigued with the morning chase, lay stretched on the turf by his side, his gun, that would not miss, reclined in the neuk of the bothy, the skian dhu of the sharp edge hung by his side, and these alone constituted his company. As the hunter sat listening to the howling storm as it whistled by, there entered at the door an apparently poor weather-beaten cat, shivering with cold, and drenched to the skin. On observing her, the hairs of the dogs became erected bristles, and they immediately rose to attack the pitiable cat, which stood trembling at the door. "Great hunter of the hills," exclaims the poor-looking trembling cat, "I claim your protection. I know your hatred to my craft, and perhaps it is just. Still spare, oh spare a poor jaded wretch, who thus flies to you for protection from the cruelty and oppression of her sisterhood." 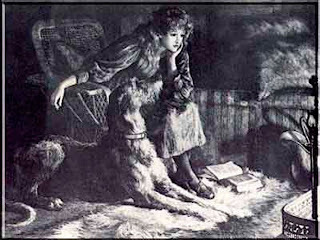 Moved to compassion by her eloquent address, and disdaining to take advantage of his greatest enemy in such a seemingly forlorn situation, he pacified his infuriated dogs, and desired her to come forward to the fire and warm herself. "Nay," says she, "in the first place, you will please bind with this long hair those two furious hounds of yours, for I am afraid they will tear my poor hams to pieces. I pray you, therefore, my dear sir, that you would have the goodness to bind them together by the necks with this long hair." But the curious nature of the hair induced the hunter to dissemble a little. Instead of having bound his dogs with it, as he pretended, he threw it across a beam of wood which connected the couple of the bothy. The witch then, supposing the dogs securely bound, approached the fire, and squatted herself down as if to dry herself. She had not sitten many minutes, when the hunter could easily discover a striking increase in her size, which he could not forbear remarking in a jocular manner to herself. "Hunter of the Hills, your hour of reckoning is arrived. Behold me before you, the avowed champion of my devoted sisterhood, of whom Macgillichallum of Razay and you were always the most relentless enemies. But Razay is no more. His last breath is fled. He lies a lifeless corpse on the bottom of the main; and now, Hunter of the Hills, it is your turn." With these words, assuming a most hideous and terrific appearance, she made a spring at the hunter. The two dogs, which she supposed securely bound by the infernal hair, sprung at her in her turn, and a most furious conflict ensued. The witch, thus unexpectedly attacked by the dogs, now began to repent of her temerity. "Fasten, hair, fasten," she perpetually exclaimed, supposing the dogs to have been bound by the hair; and so effectually did the hair fasten, according to her order, that it at last snapt the beam in twain. At length, finding herself completely overpowered, she attempted a retreat, but so closely were the hounds fastened in her breasts, that it was with no small difficulty she could get herself disengaged from them. Screaming and shrieking, the Wife of Laggan dragged herself out of the house, trailing after the dogs, which were fastened in her so closely that they never loosed their hold until she demolished every tooth in their beads. Then metamorphosing herself into the likeness of a raven, she fled over the mountains in the direction of her home. The two faithful dogs, bleeding and exhausted, returned to their master, and, in the act of caressing his hand, both fell down and expired at his feet. Regretting their loss with a sorrow only known to the parent who weeps over the remains of departed children, he buried his devoted dogs, and returned home to his family. His wife was not in the house when he arrived, but she soon made her appearance. "Where have you been, my love?" inquired the husband. "Indeed," replies she, "I have been seeing the Goodwife of Laggan, who has been just seized with so severe an illness that she is not expected to live for any time." "Ay! ay!" says he, "what is the matter with the worthy woman?" "She was all day absent in the moss at her peats," replies the wife, "and was seized with a sudden colic, in consequence of getting wet feet; and now all her friends and neighbours are expecting her desmission." "Poor woman," says the husband; "I am sorry for her. Get me some dinner; it will be right that I should go and see her also." Dinner being provided and despatched, the hunter immediately proceeded to the house of Laggan, where he found a great assemblage of neighbours mourning, with great sincerity, the approaching decease of a woman whom. they all had hitherto esteemed virtuous. The hunter, walking up to the sick woman's bed in a rage, proportioned to the greatness of its cause, stripped the sick woman of all her coverings. "My ill-requited friends, spare an old acquaintance, already in the agonies of death, from any further mortal degradation. My crimes and my folly now stare me in the face, in their true colours; while my vile and perfidious seducer, the enemy of your temporal and spiritual interests, only laughs at me in my distress; and, as a reward for my fidelity to his interest, in seducing everything that was amiable, and in destroying everything that was good, he is now about to consign my soul to eternal misery. Let my example be a warning to all the people of the earth to shun the fatal rock on which I have split; and as a strong inducement for them to do so I shall atone for my iniquity to the utmost of my ability by detailing to you the awful history of my life." Here the Wife of Laggan detailed at full length the way she was seduced into the service of the Evil One, all the criminal adventures in which she had been engaged, and ended with a particular account of the death of Macgillichallum of Razay, and her attack upon the hunter, and then expired. Meanwhile a neighbour of the Wife of Laggan was returning home late at night from Strathdearn, where he had been upon some business, and had just entered the dreary forest of Monalea, in Badenoch, when he met a woman dressed in black, who ran with great speed, and inquired of the traveller, with great agitation, how far she was distant from the churchyard of Dalarossie, and if she could be there by twelve o'clock. The traveller told her she might, if she continued to go at the same pace that she did then. She then fled alongst the road, uttering the most desponding lamentations, and the traveller continued his road to Badenoch. He had not, however, walked many miles when he met a large black dog, which travelled past him with much velocity, as if upon the scent of a track or footsteps; and soon after he met another large black dog sweeping along in the same manner. The last dog, however, was scarcely past, when he met a stout black man on a fine fleet black courser, prancing along in the same direction after the dogs. "Pray," says the rider to the traveller, did you meet a woman as you came along the hill? The traveller replied in the affirmative. "And did you meet a dog soon after?" rejoined the rider. The traveller replied he did. "And," added the rider, "do you think the dog will overtake her ere she can reach the church of Dalarossie?" "He will, at any rate, be very close upon her heels," answered the traveller. Each then took his own way. But before the traveller had got the length of Glenbanchar, the rider overtook him on his return, with the foresaid woman before him across the bow of his saddle, and one of the dogs fixed in her breast, and another in her thigh. "Where did you overtake the woman?" inquired the traveller. "Just as she was entering the churchyard of Dalarossie," was his reply. On the traveller's return home, he heard of the fate of the unfortunate Wife of Laggan, which soon explained the nature of the company he had met on the road. It was, no doubt, the spirit of the Wife of Laggan flying for protection from the infernal spirits (to whom she had sold herself), to the churchyard of Dalarossie, which is so sacred a place that a witch is immediately dissolved from all her ties with Satan on making a pilgrimage to it, either dead or alive. But it seems the unhappy Wife of Laggan was a stage too late. Did you know, that a deerhound along with a collie, attacks White Fang the Wolfdog from Alaska in Jack London’s novel White Fang ? Chapter 11 - check it out. The joy of being a Scottish deerhound in Scotland in the midst of this current global economic meltdown, is that; all the money in the world doesn’t buy the beauty of the Highlands, nor the life in it. Nor does anyone outlive this land long enough to own it forever. Monies come - monies go - careers appear and disappear, the human race changes with every shot of the starter pistol, but we deerhounds just go on doing what we always have done, and always will do . . . hunting the hart. 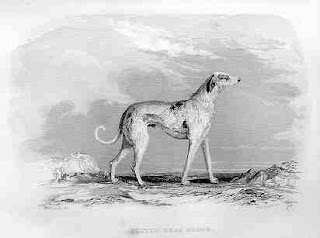 And where else does one hunt for deerhound histories other than Rogues blog (write and tell us)? 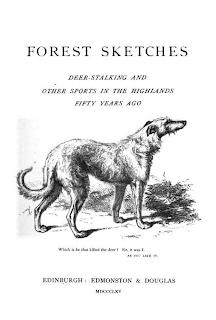 And if you wish to read of the Scottish Highland Hounds from two hundred years ago (the Napoleonic period) click on the Title of the book listed below for a free pdf download of this book. The excellent sketches featured as part of this post are a selection from several contained within the pdf download. But be patient as this is an 8.5mb download and the document has three hundred plus pages included in the book and it may take some time to download dependent upon your connection speed. Summer’s Gone . . .
. . . but we’re still here. It’s been an ultra-busy five weeks since the last posting, between the coursing, kennel redocorating, retiral parties, recording an album, marathon and extreme trail running, being part of the Hampden Roar as part of the Tartan Army on the journey to the Fifa World Cup finals.